Upper Hutt Primary School prides itself on its inclusive policies. It takes a whole-of-school and community approach to integrate all children into its welcoming orbit. Summer Kilburn is six years old, and is keen to show her teacher all the k’s (for Kilburn) in the poem on the board. She also points out “m” for mummy and “s” for Summer. Teacher Kirsten Foley has called her to the mat during a literacy session – they are looking at word combinations ick, eck, ack, ock which are plentiful in the poem. Summer is keen, and fast, and the children are all watching and clap. She knows she has done well. Summer has Down Syndrome and is fully integrated into the classroom and works with her peers on most activities as part of the school’s commitment to inclusion. She goes back to sit with her friend Grace, who she often sits beside, along with her teacher aide Fiona Woodhouse. Woodhouse has been a teacher aide at the school for 23 years. She says that Summer is doing well with her communication and reading and loves being in her classroom with her friends. There are indications all around the school which show that inclusion is seamlessly embedded within its culture – from the ramps to all the classrooms, handrails, self-opening doors and play spaces, to the visual supports and props within the classes; the school’s philosophy of PRIDE – Partnership, Respect, Integrity, Determination and Empathy – is for all students. The school’s principal is proud of its inclusive policies. Jo Grant says, “Our belief is that children sit at the heart of everything that we do – we want to support every child to be in an open, welcoming and accepting space that serves its community. “At a fully inclusive school, diversity is a given. All students are respected, welcomed and valued. Our school vision is that every learner deserves a positive future. Every child brings unique experiences, needs and strengths to their learning and we uphold the curricula around children being confident, connected and actively involved, lifelong learners. Children’s identities, languages, abilities and talents are recognised and affirmed and their learning is our focus. Underpinning the pedagogy of the school is the Universal Design for Learning (UDL) model – a research-based approach to support the design of more flexible inclusive learning environments “optimised for personalisation”. Through a robust school monitoring system, barriers to students’ learning are quickly identified and supported in partnership with the students and those who know them well. The school has completed the inclusive practices survey which included asking children and whānau for their views on what they would like for their school. The school has created a special sensory room: this is a hut in the corner with cushions inside and stars on the ceiling – a dark and peaceful escape from the emotions that sometimes overwhelm children with additional needs. Cushions, soft toys and blankets can be seen in another corner together with an indoor trampoline which is “especially good for rainy days” when children cannot get outside. There is also a swing chair in the porch outside – the gentle rocking motion soothes children who may be experiencing a sensory overload. To help children who have mobility challenges, the school has a special trike which is operated by both the student and an adult. 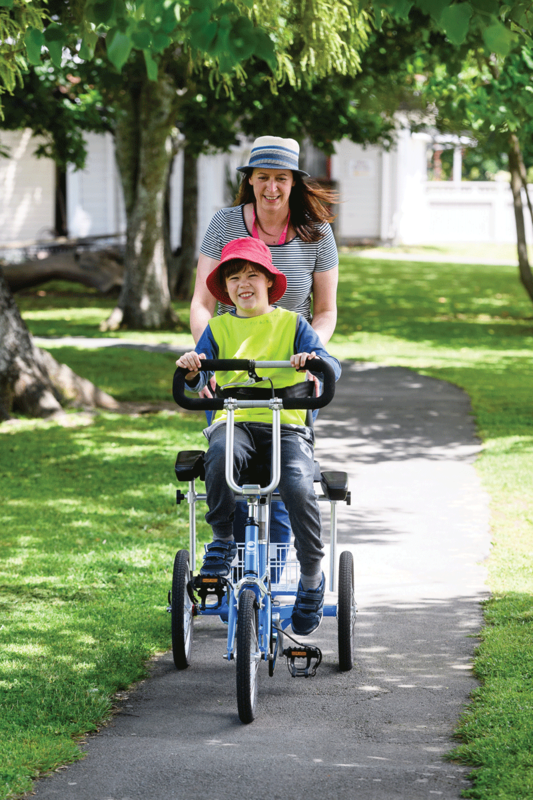 Sarah Cobbum – an ORS-funded teacher – takes student Miles out for a ride around the stunning school grounds under oak trees and around the gardens on a warm summer afternoon. The bike allows him to increase mobility and have a break from the classroom. The support of the school’s board of trustees is vital in terms of what the school is able to achieve. Grant says, “Our board are wonderful and very committed enablers with a high level of social focus and expertise. They trust us to do the very best for our children.” To this end the school has its fulltime ORS-funded teacher as well as investing in a SENCO role. 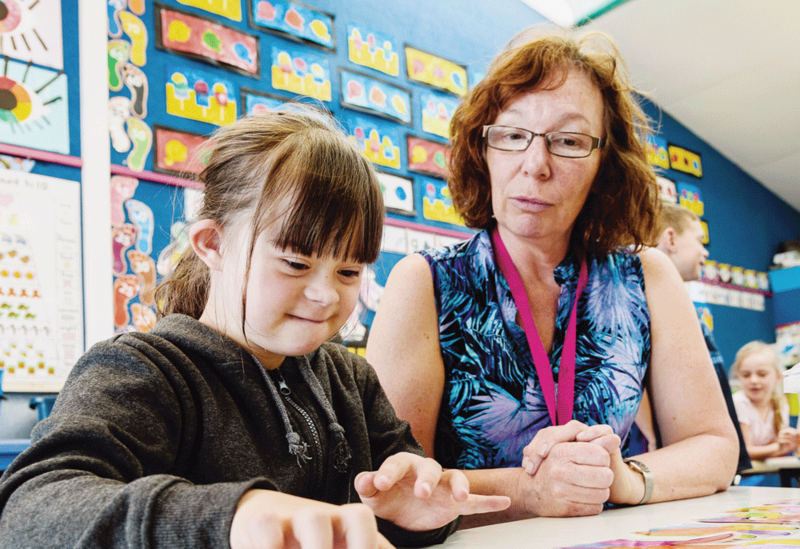 Grant’s sentiments were reiterated in a recent opinion piece by the Disability Rights Commissioner Paula Tesoriero in which she said that inclusive education meant all children can attend the school of their first choice and receive the support they need to thrive alongside their peers. But many children with additional needs are not getting what they need, she said. “Disabled people make up 24% of the population, but disabled children are not getting a fair go in the education system. That is a huge chunk of New Zealanders we are letting down. It is through the commitment of schools such as Upper Hutt Primary that children are getting the support they need to thrive. Sarah Cobbum, the ORS-funded teacher, is relatively new to the school, having been there for just two terms. Before this role, she had spent 20 years in the classroom. She currently does a lot of the administrative work connected to the planning and support needed for ORS children. Cobbum works closely with Jackie Lindsay who is the school’s SENCO. The role of the SENCO is to ensure that all non- ORS funded students who have additional needs are also well catered for. This includes students with ASD, ADHD, dyslexia, dyspraxia, global learning delays, medical conditions such as diabetes, and children with anxiety problems. Together Cobbum and Lindsay plan termly IEPs for their “target” students. These IEP meetings include members of the students’ families, together with relevant specialists, for example, speech language therapists, occupational therapists, psychologists; the class teacher and the teacher aide; and when possible, the student. The specialist teachers, class teachers and teacher aides at the school all work collaboratively on the goals set for the students. The specialist teachers, class teachers and teacher aides at the school all work collaboratively on the goals set for the students. Students are closely monitored and there are regular meetings to ensure that the goals set are achieved. Cobbum and Lindsay both say that teacher aides are crucial in being able to achieve positive outcomes for their students. To this end, teacher aides are included in some staff professional development days. Cobbum and Lindsay also run their own training for teacher aides as well as managing the appraisal system for each teacher aide. Each teacher aide has annual learning goals which they are supported to develop and explore. Times of transition are critical in any child’s life and to this end the school has a well-established transition process for all children starting school. Lindsay, together with the school’s deputy principal (junior), runs pre-school afternoons for those children who are soon to start school. Children needing extra support may have additional visits, social stories and Starting School books written for them. Some students may have shortened days to help them cope once they begin school. While carefully transitioning children into school is important, the school also values the importance of transitions which happen when children change classes. While carefully transitioning children into school is important, the school also values the importance of transitions which happen when children change classes. Information sharing days are arranged between the child’s current and new teacher. Pen Pictures and All About Me stories are written so that the new teacher is familiar with the child and the journey they have been on since they started school. The child, together with a teacher aide, has repeated visits to their new class and teacher. Social stories and visual reminder cards may be made and use is made of Skype and emails for teachers who will be new to the school. A similar process is used for children who are transitioning from the school. While there are key components which help to make a school inclusive, true inclusivity cannot be achieved without commitment from all. Special education has always been at the cutting edge of thinking in education and has provided an exemplar for what is good for all children’s learning and wellbeing. That is the view of Liz Tomlinson, Ministry of Education special education adviser in Wellington. 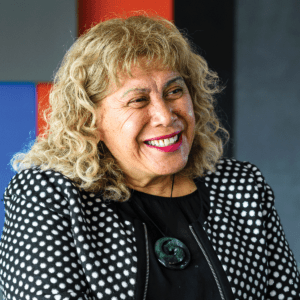 Tomlinson talks with great passion and energy about her job, the children, whānau and educators she works with, and says that what works for children with additional needs, works for all children. She fires off some examples. “All the new innovations that come into the classroom start in learning support (or what used to be called special education), such as the way we use visuals. It was a move away from chalk and talk. Then we saw visual diaries, took photos of things, adapted environments to take account of sensory needs, for example, a quiet space, movement/sensory breaks; and taking account of how different children learn differently – these have all come from special education. She also uses the examples of sign language and gesture, because our hands are a valuable, easy-to-access resource that we always carry with us; and giving children a visual schedule, which is beneficial for all children. Tomlinson says because of this, children in schools with children with additional needs share a wealth of experience that they may not otherwise have had, and all children and educators have benefitted from the advances in learning support pedagogy. Tomlinson has been a special education advisor for nearly 15 years, and before this had a variety of roles in the wider learning support area including: teacher in an IHC “pre-school”, teacher assistant, teacher in a special school, classroom teacher and senior manager in a mainstream school, SENCO and an ORS specialist teacher. She says there are some stand-out things about schools, centres and communities which are truly inclusive. “The key thing is how every adult in that community values every child. True diversity – whether it is ability, culture, religion – that is the underlying principle of inclusion. 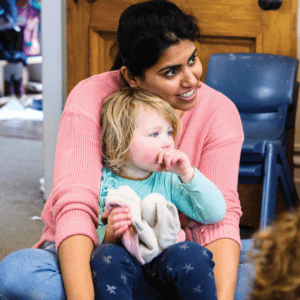 No teacher is there for the easy job – they are there for their commitment to children, and when they realise that … you can see that in their practice. There are clues when you walk into a school or centre. “The school might have visuals, for example, ‘stop’ signs, and photos of who is on duty; there might be lines on the stairs [for visually impaired children] and handrails. All this is important, so that they can access property and the staff. She says that teachers are very busy in a classroom and for teachers to support the learning of a child with additional needs can feel like a big thing. “But it is important that every teacher ‘owns’ every child in the class, they own the programme and give good guidance for the teacher aides and work together on resources, and meet together regularly. That is, taking responsibility for the whole class including the child with additional needs. It can be as simple as greeting the child with additional needs when they enter the class, having a place or desk in a group with peers and talking to them occasionally during a lesson – just as the teacher would do for all the other students. “I can walk into a class and can tell what it is like for a child with additional needs. I may see all children working together with a teacher aide hovering – I can see how the student fits into the scene. But there may be the teacher aide at a desk with the child at the back of the classroom – the student is present but not belonging to the group, which is not inclusive. “A great education programme is one where every child is included and the work is suited to the child’s needs. “I like to think about that child in the future, in the community – being with people and what they need – to communicate, to not be isolated because of different interests or behaviour, being able to catch a bus and read the labels on products at the supermarket [that sort of thing]. Tomlinson says that the goal of the special education adviser is to encourage and support all students to successfully attend their local school, to have a sense of belonging, to participate in the school culture, and be able to access meaningful learning. She says it is not as easy as it sounds. She says it is not always straightforward; there is a lot of interpretation and detective work involved – especially for non-verbal students. She says working collaboratively with learning support colleagues (speech language therapists, psychologists, occupational therapists, physiotherapists, early intervention teachers and advisers of the deaf) as well as other agencies is important. She says it is also about empowerment for those who know the child best. “The teaching staff and whānau know the child best, and have the strongest relationships with the child, spend the most time with the child and have the most influence over the child. That is why our service is based on advice and guidance and not one-to-one hands on. “As special education advisers we can observe, give guidance for goal setting, adaptations and strategies, make some assessments and recommendations and even model those. But the people on the ground – the whānau, teachers, teacher aides – they spend much more time with the student and therefore have the most power to teach the child. Therefore we want to empower those valuable people to be confident and capable in their work. “There is a lot of trial and error – diversity means that there is no one fit to meet all; that is why we value the individualised planning approach. It also means that it’s a time-consuming process that relies heavily on strong relationships with all the people around the student. She uses the example of a boy who had been excluded from many schools but managed to find a placement in one school. By then he was a young adult. The school persisted in helping him, along with a range of people including the family. 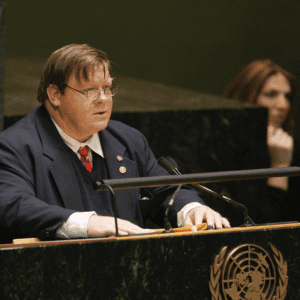 Tomlinson says that there is a lot that could be done to make it easier for special education advisers (SEAs) to do their job well, including getting more professional recognition. This includes recruitment of the most highly skilled specialist teachers who have both proven successful field experience as well as qualifications rather than prioritising qualifications only. Recruitment, however, she says, is not easy and there needs to be a professional body of skilled, trained and experienced specialist teachers with a job title that reflects the role. Getting specialist knowledge and keeping it is problematic. Recruitment is not easy and there needs to be a professional body of skilled, trained and experienced specialist teachers with a job title that reflects the role. She says it is partly because of the model of (ORS) funding being attached to the child; well-intentioned but the outcome is that ORS specialist teachers still do not have the benefits of job security (the job is lost when the student leaves that school), nor the benefits that should accompany a highly skilled job working with the most challenging of learners, for example, remuneration, training, travel costs and so on. Ironically, RTLBs who are tasked to work with students with moderate learning and behaviour needs have better contracts. She says the combination of these issues has led to a deficit of skilled, experienced specialist teachers in schools, meaning a small pool to draw upon for SEA roles. Carol Webb has thought a lot about what makes a great inclusive school. But she likes to think a lot more widely than that – to the student’s future and their place in the community and how a school is the first step on this journey. Webb is a teacher aide at Hamilton’s Fairfield College. She believes that for the student, while academic success is important, the self-esteem and confidence that comes with social skills, which will help them in the wider world, are equally important. She has kept in touch with some of her students after they have left school and is heartened that many have found jobs and a sense of wellbeing. For the student, while academic success is important, the self-esteem and confidence that comes with social skills, which will help them in the wider world, are equally important. She gives the example of a student for whom English was a second language being diagnosed with dyslexia. Webb says a great inclusive school is where all staff are supportive and there are diverse programmes for all children. She says that this helps the relationships between teachers and teacher aides but even more joint work could be done. She says many schools could, and do, look more widely for help and support. Webb has been a teacher aide in primary and secondary schools in New Zealand since 2009. She believes teacher aides have a critical role in contributing to the whole-of-school approach to supporting children with additional needs. Webb has been part of the NZEI pay equity campaign for support staff. 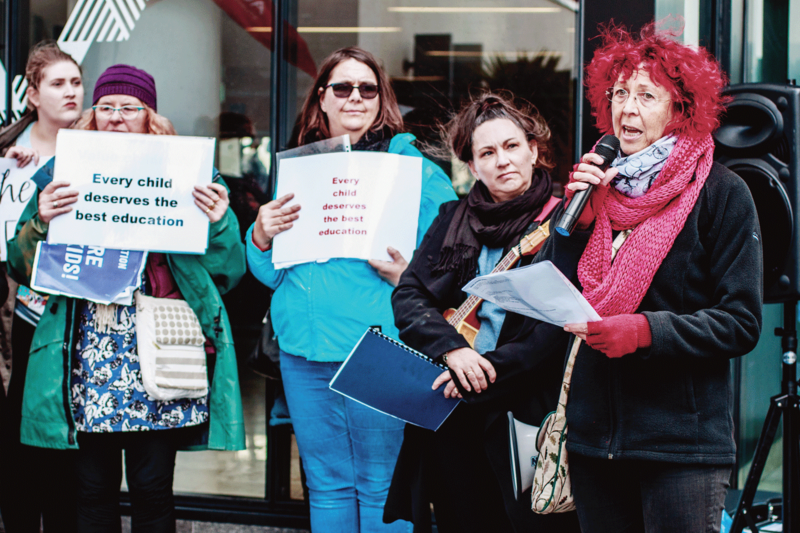 “We need job security and a fair wage.” The recent government announcement that an additional 600 Learning Support Co-ordinators will be funded in schools is recognition of the critical role of SENCOs. 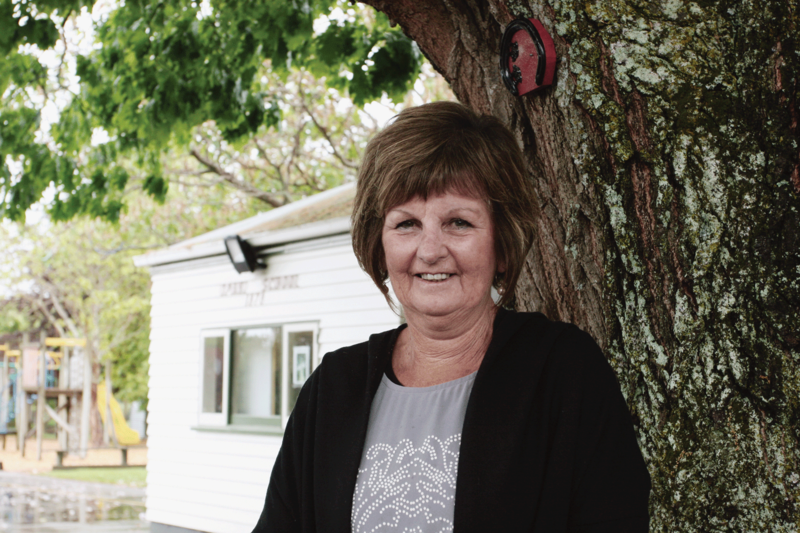 Lynn Schaefer has been at Opaki School for 28 years. She has been in the office most of that time but as is the wont with support staff in schools, she has also been a teacher aide and filled in various other roles as needed. She does the finance, payroll, operates the Xero accounting and all other office-related work. The rural school on the outskirts of Masterton has 204 children. Most are from the surrounding countryside and some come from “town”. Over the years the school has had students with additional needs and Schaefer has been instrumental in their care – pastoral, dispensing medication, treating injuries and medical events and as a teacher aide in their learning. The role of support staff admin can be underestimated in contributing to an inclusive school – be it in the office, in the library or in a technical position. The person in the office is the first person who parents, caregivers and whānau meet and is often the person who they will tell their problems to. Lynn says she is a good listener and she has helped many families in their times of trouble. “I say to parents ring whenever you are unsure of anything. I try to be really welcoming – parents are often nervous and the child is too. It is often just about listening. 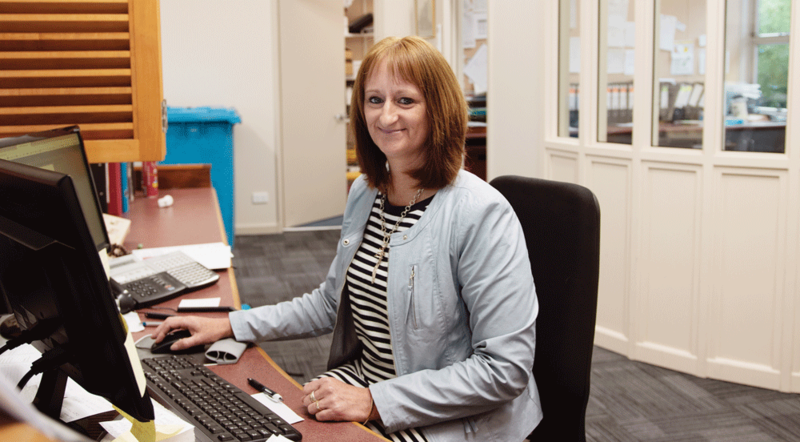 Carmen Marshall manages the ICT for staff and student computers and accounts at Bohally Intermediate in Blenheim. It is something that she learnt on the job, apart from some training that she received from IT companies which the school has used previously and their current IT provider. Marshall started out in the school canteen and has had a number of support staff roles in the school but has ended up in the ICT role as there was a need for this. She says that the devices children use have had an unexpected benefit for children with additional learning needs as technology can be a great leveller.